Neem oil insecticide is an effective and natural way to get rid of bugs on houseplants, or battle tough insect pests out in the garden. Below you will find information about neem, learn how to use neem oil for insect control, and I’ll also show you how to make neem oil spray for plants using my neem oil insecticide recipe. Dealing with houseplant pests is one of the biggest frustrations indoor gardeners face. Sometimes it seems that no matter how careful we are, our precious houseplants become infested with some bug or another… and it gets very stressful! Bugs are also a major struggle for most gardeners outside in the garden. It can be so overwhelming that some people feel like giving up on gardening all together. Plant pest control doesn’t have to be so difficult, you just need the right tools to help in your fight. Let me introduce you to neem oil insecticide, your new best friend! Neem oil is a naturally occurring insecticide that is found in the seeds of the Indian neem tree. The oil is extracted from the neem tree seeds and is either sold in it’s pure form, or mixed with other ingredients to make neem based pesticide sprays. A common misconception is that neem oil is a type of poison. Neem oil is not a poison, but rather has a chemical effect on the bugs that eat it, which eventually ends up killing them. Basically, the way it works is that it messes with the brains and hormones of the bugs, so they stop eating and mating, and eventually die off. Neem oil also works to smother the pests, which kills them faster. In addition to killing plant pests, neem oil repels them, and it has a slight residual effect to keep bugs away longer than other organic pest control methods. Neem oil won’t kill all of the pests on contact, so it might take a few days, weeks or even months for all of the bugs to disappear from the plant. The best part about neem oil is that it only works to kill the bugs that eat the plants, so it won’t residually kill any beneficial insects! This is huge, especially if you plan to spray neem oil on plants that are outside, or you want to use it in your garden. Just be careful when you’re spraying it outside to make sure that you don’t spray neem oil directly on any beneficial bugs, because it could still smother them on contact. It’s also safe to use indoors, and I mainly use neem oil for houseplants since battling bugs can be a common occurrence during the long winter months. It has helped me get rid of all of the houseplant pests I’ve ever dealt with, and helps to keep my indoor plants pest free! What Kind Of Bugs Does Neem Oil Kill? 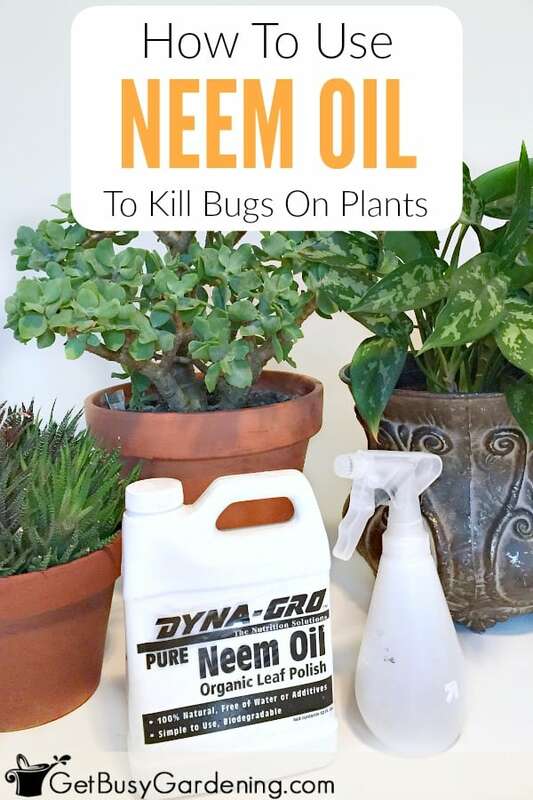 Neem oil works to kill all kinds of pest insects, and I’ve successfully used it to help rid my home of houseplant pests like spider mites, whiteflies, houseplant scale, aphids, fungus gnats and mealybugs. In addition to killing annoying houseplant pests, neem oil can be used outside in the garden to help control bugs like destructive caterpillars, beetles, worms and any other plant-eating pests. 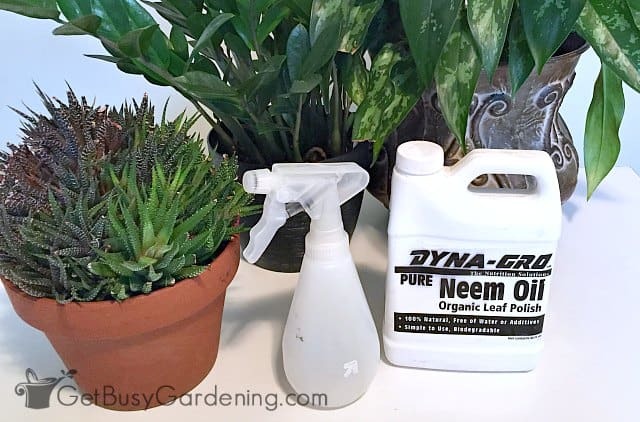 Using neem oil for organic pest control on my houseplants was a total game changer for me! I love my houseplants, and indoor gardening is one of my favorite winter hobbies. But I’ve spent enough of my time dealing with houseplant pests, and I’m tired of all the fuss. So, I finally purchased some organic neem oil to use against pesty houseplant pests. There’s no way I’m using chemical pesticides, so the fact that neem oil is a natural, organic product is awesome. A few years ago, we decided to try growing a pepper plant hydroponically. I’ve tried overwintering pepper plants in the house before, and I found that no amount of cleaning them would keep the aphids away. Pepper plants are serious aphid magnets. Since aphids multiply very quickly, and I didn’t want to spend my winter fighting them again (and risk a repeat of the aphid outbreak I had in 2009, ugh! ), I decided to give neem oil a try. I am happy to report that our pepper plant has been aphid free since we started using neem oil for pest control. Since using neem oil for aphids worked so great, I tried it on the whiteflies that had plagued my hibiscus and plumeria plants for five years, and it worked like a charm! 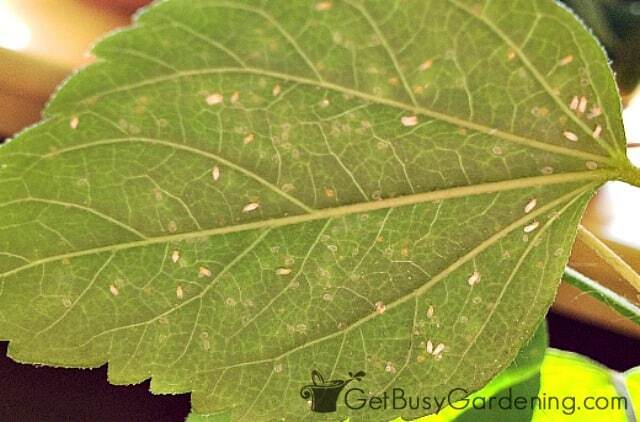 I haven’t seen a single whitefly since I started using neem oil on my hibiscus and plumeria plants, woohoo! Now neem oil is my go-to organic pest control method. If you’ve never used neem oil before, it’s important to note that it has a strong smell to it that many people don’t like. The neem oil smell goes away once it dries, but it can be overpowering if you’re spraying it on a lot of your houseplants at once indoors. Also, before spraying anything, including neem oil, on any of your plants, always be sure to test it on one or two leaves first to make sure the spray won’t harm the plant. To test it, douse a leaf or two with the neem spray mix, then leave it sit for at least 24 hours (one week to be safe). If there’s no damage to the treated leaf, then it’s safe to spray the whole plant. And please remember that all forms of pesticides, even natural ones like neem oil organic pesticide, should be used with care. Always follow the instructions on the label when using neem oil insecticide, and take care not inhale or swallow it, or spray it directly on any beneficial insects. Once you see bugs on your plants, it’s important to begin neem oil treatment right away. Spray the entire plant with neem oil insecticide, taking care to spray under all of the leaves, and thoroughly wet every nook and cranny of the plant. 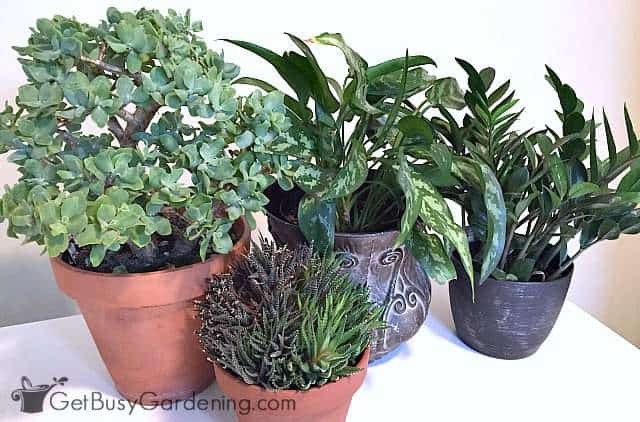 If I’m using it inside, I always bring my houseplants to a sink or bathtub so that I can spray them without worrying about getting neem oil all over the carpet or woodwork. I’ve never had problems with staining or anything like that, but you want to spray the plant to the point where it’s dripping wet, so it can be messy. For heavy infestations, I will use insecticidal soap before spraying neem oil on the plants (be sure to spot test this on your plant before treating the whole thing). I wash the leaves with the insecticidal soap, which kills many of the bugs on contact, then I rinse off as many of them as I can before spraying the plant with neem oil (my recipe for DIY insecticidal soap is 1 tsp of Dr. Bronner’s Baby-mild Liquid Soap per 1 liter of water). 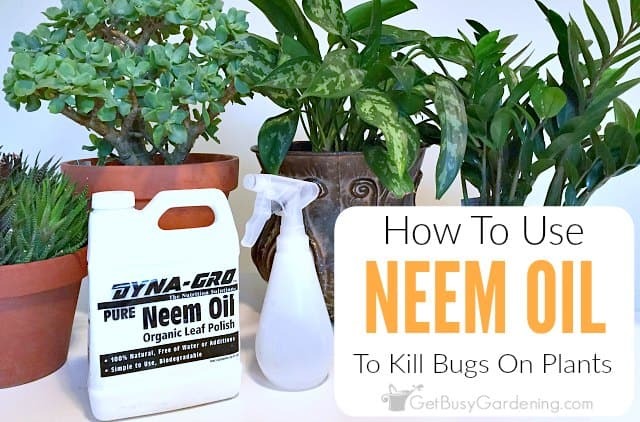 Neem oil insecticide can also be used as a soil drench to kill annoying fungus gnats. When used as a soil drench, it can be absorbed by the plant and work as a systemic pesticide as well. Remember that neem oil has a residual effect, so you don’t have to spray the plant every day like you would with other all natural pest control methods. This residual effect also helps with pest prevention! Like I mentioned above, neem oil won’t kill all of the bugs on the plant instantly, it takes time to get into their system and start messing with their brains and hormones. You could wait until you see evidence of plant pests before spraying the plant again, because the infestation might go away completely after applying neem oil the first time. 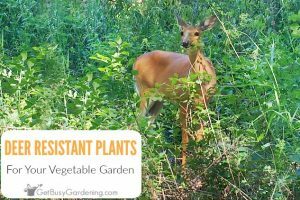 For plants that are plagued by pests that always end up coming back, you can spray your plant every few weeks until you no longer see any bugs, and then spray it every month as a neem oil repellent to keep them from coming back. You can buy neem oil based pesticides in pre-made sprays, or you can make your own using a pure organic neem oil concentrate for plants (which is what I do). The soap helps the oil mix with water, since they don’t mix well on their own. 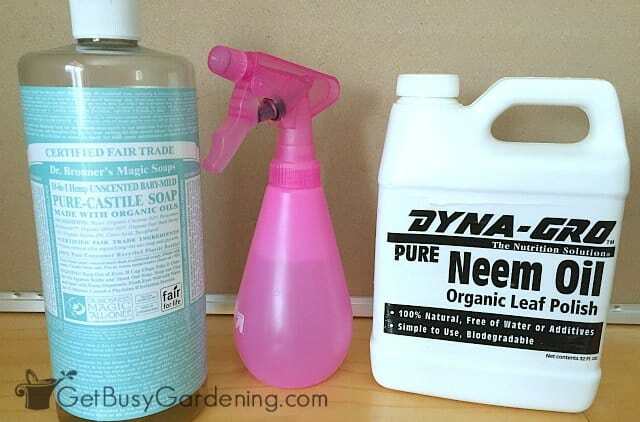 Plus the soap has the added benefit of killing the plant pests on contact, so you should see an improvement right away with this DIY neem oil insecticidal soap. Mix all of the ingredients into a spray bottle and shake well. You can use your DIY neem oil bug spray on your plants right away. Be sure to shake it well each time you use it. You can find neem oil for sale anywhere that pest control products are sold, or order neem oil online. But be sure to always check the label. Just because it says “neem oil insecticide” doesn’t mean that it doesn’t contain other harmful chemicals. Buying neem oil concentrate will probably be more expensive than a pre-mixed spray, but it will last you a very long time! Plus, you control the amount of concentrate that’s in the spray, and many times a DIY organic neem oil spray will be much more potent than a pre-made one. I buy organic neem oil concentrate online, and if you want to get the same kind as I use, you can buy neem oil here. Oh, and keep in mind that you can buy neem oil for cosmetic use to, so be sure to specifically search for “neem oil for plants” when shopping online. If you have never tried using neem oil for indoor plants, I would highly recommend trying it. 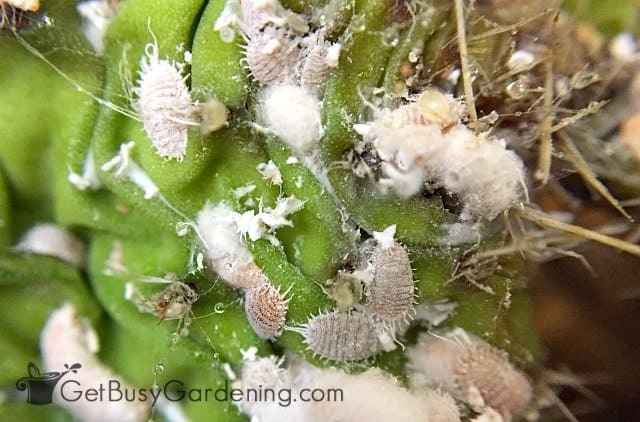 If you are tired of fighting indoor plant pest infestations, it’s by far one of the best pest control methods I’ve ever used. Admittedly, I haven’t used it used it out in the garden yet, but plan to give it a try this year. I can’t wait to see if it works against all the nasty bugs that plague my garden plants every summer! If you’re struggling to keep bugs off your houseplants, then my Houseplant Pest Control eBook is for you! It will show you how to identify which bug is infesting your plant, and show you exactly how to get rid of it FOR GOOD! Download your copy today! Have you ever tried using neem oil insecticide on houseplants or in your garden? Share your experiences in the comments below. I tried eradicating scale insect which is a menace to my orchids and mealy bugs to some of my plants which they keep coming back. Then I tried using neem oil and light soap for the mixture. I got it from an Indian store which sells it very cheap – like a sundry price. And it worked so far.. The only setback – there is this oil fragrance that is a bit repulsive. Glad to hear you had success using neem oil! It does have a strong smell, but it goes away after a few minutes, so it hasn't bothered me too much. At least you know it's not a toxic substance you're breathing in, that's a good thing. what is the proportions of the mixture of neem oil & soap for control of mealy bug, is it diluted with water? several of my plants are infested with the pests. Follow the instructions on the Neem oil label. It depends on how concentrated your Neem oil is. Neem oil seems to work well at combatting black spot on my roses, as well. Oooo, good to know! I wonder if it will work on other types of fungi. I’ll have to give it a try. yes it will works as both fungicide nd insecticide.. I have used neem oil to combat aphids and spider mites on my hibiscus. My plant sits in front of a window so I sprayed it in the evening. 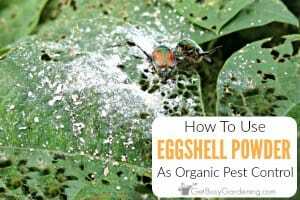 i have never used it before so I sprayed as much of the plant as I could, cause I read it only kills aphids if it hits them and I had aphids all around the flower buds and underside of my hibiscus flowers. It is approximately one week later and there are no buds on my plant and i have about half of the leaves have turned yellow….help! did I just shock the plant? could it be that the sunny window the next day fried the leaves or is it safe once it dries on the plant? This is my first plant I have taken in the house in the fall, and I did not know I needed to give it a good water soaking before I brought it in! It did not have aphids outside and was flourishing. It actually did well and was blooming tons till I sprayed it with the neem. Please keep in mind that it is November, and I think this plant also can go “dormant” at certain times of the year but the fact that I sprayed it last week seems important. It’s not uncommon for a hibiscus to start dropping it’s leaves and buds once it comes indoors in the fall – and like you said, hibiscus plants will start to go dormant for winter. I would make sure that you are watering it consistently (don’t overwater though), and keep an eye on it. The sun coming through the window at this time of the year probably isn’t strong enough to burn the leaves. I’m guessing that the shock of moving indoors is what’s causing the yellow leaves, and not the neem oil. Thank you! The interesting part is that the majority of the leaves that turned yellow, didnt fall off. I picked them off. The bush still has approx. half of its leaves and is looking better this week vs last. I do see small fruit fly type flies sometimes around the plant and there is definately some sort of little worm in the soil, they are very tiny. Im assuming they are from the soil that the plant came with in its original pot cause i only used potting soil when I replanted it in the summer. Do you have any concerns with these details and do you suggest I give the plant any nutrients or miracle grow or anything??? Don’t fertilize it during the winter, maintain it in it’s semi dormant state. Once it gets used to being inside, you should start to see new growth and it will probably even flower for you this winter. of the mixture ratio?So i poured a small amount of neem oil in a water spray bottle with dawn dish soap and sprayed it on a white infestation(possibly scales) causing harm to my hibiscus plants.What should i do next? Did I cause harm to my plants? Are you sure it was the neem oil that caused the damage? I’ve never had an issue spraying it on my hibiscus. It could be the bugs cause the damage. Sounds like it could be mealy bugs. dawn is a detergent, not soap. detergent can cause damage to delicate plants. Its is mealy bugs.I poured a solution of 3-1 from lowes.Well sees if it works. Oh bummer!! 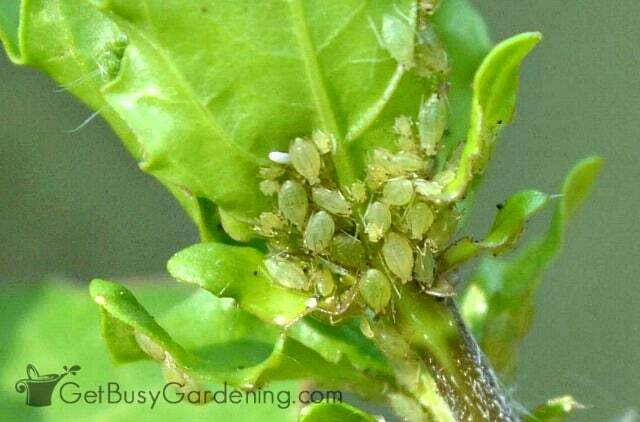 Chemical pesticides don’t usually work on mealybugs, they are immune to most chemical pesticides. I would stick with the Neem oil and also work to dab the mealybugs off with a cotton swab soaked in rubbing alcohol. In time, they will die off. Good luck! I am going to try and buy it local and use it on my grapes for Japanese Beetles anyone ever use it for those critters and did it work? Yes I came home from a long trip and all my plants were infested with Japanese beatle bugs, I sprayed them with need oil and caught as many has I could and drowned them in soapy water after two days they were all gone but my neighbor who doesn’t take advice had swords on his fruit trees. This year I’ll spray before I leave town to be safe. Can I use neem oil on a jade plant? My jades have been outside for the summer and I want to bring them in without infecting other plants! I’ve heard that neem oil or Murphys oil soap can harm jades and cause them to suffocate from the oil. Is this true? What should I treat a jade with for scale? They also look like they have some kind of fungus on them. It’s a white fuzzy patch (not mealy bugs) and underneath the patch its all brown. Not sure if I should go straight to liquid sevin or not! Thanx so much for any advice! I have an indoor greenhouse and don’t want to bring anything in! I haven’t used neem oil on my jade plant before, because I haven’t needed to. But, it should be safe to use as long as you buy the pure oil (with no other chemical additives that many companies put in). The stuff I buy (shown above) is organic, and pure neem oil. Follow the directions on the label to use it on your plant. I would test it on your jade before spraying the whole plant. Spray a few leaves and leave it for a week and make sure the spray didn’t cause any damage. Amy, Thanx for all your valuable info. I just bought your e-book for battling bugs on indoor plants! Do you use Neem oil on even your succulent plants too? Do you also ‘wash’ them in the tub of soapy water and neem before bringing them inside for the winter? It seems like they would get way too wet after submerging them for 10 minutes or so and get “rot” from being too wet! 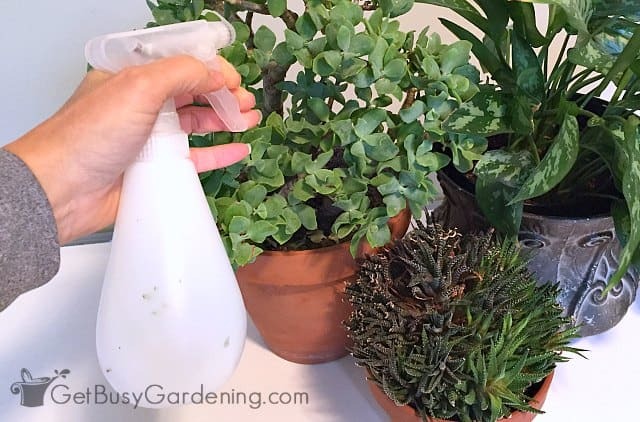 OR do you just use a spray bottle on the succulents with the neem and soap? Thanx, you’re a great help! You’re welcome Sherry, thanks for buying the e-book! I hope you love it! Yes, as long as you get pure neem oil (like the kind I show in this post) and then dilute it yourself it should be safe. If you’re worried, just spray it on a few leaves to test it out and give it a few days to make sure it doesn’t cause any damage. Be careful about what type of soap you use though. Use a mild liquid soap (like the one I mention above), because soaps with detergents and degreasers can cause damage to plants. I soak my plants in a tub of soapy water to debug them before bringing them inside (How To Debug Plants Before Bringing Them Indoors). I do this with all my succulents, and haven’t had a problem with them rotting. Make sure to allow the soil to dry out completely before watering them again, and only do this with plants that are in pots that have drainage holes. Also, be sure to allow the water to drain completely from the pot. I don’t put neem oil in the water when I soak the plants. I only spray neem oil on plants that are prone to pest infestations, or when I see the first signs of an infestation. We get white flies year, so I’m trying this! Hi Amy, I have lost some plants to white flies, mealy bugs and spider mites and am still battling them from the remaining surviving plants. I’m not sure if the dishwashing detergent I have is suitable. However, I do have baby bottle cleanser which can be used to wash vegetables and fruits as well. Can it substitute the dishwashing liquid soap to rid the mealy bugs and spider mites? And do I need to rinse off after spraying the plant with the solution? For routine maintenance, do I just use neem oil mixed with water or it’s neem oil with some soap mixed in water? look forward to your advice. Thank you. You can use a mild dish soap, but I don’t recommend one that contains detergent or degreaser. No, don’t rinse your plants after applying the neem oil solution. You need to mix soap into the neem oil/water mix because, since water and oil don’t naturally mix together, soap will help get them to mix. I selected Neem Oil over Sven to combat Aphids on my outdoor Hibiscus plants. Today, is the second spray. The brand I bought says to apply a seven to 14 day treatment. I notice that when I cutback the Hibiscus plants that the Aphids came to visit. Stress could be the reason. Living here in the California Desert you expect the unexpected. Q? Do you know of any reason not to apply for seven days in a row? Any other tips appreciated too. It’s that bad. Thanks. I would definitely follow the instructions on the label. Neem oil works like a charm to keep pests off my hibiscus, so it should work great for yours too. To help speed things up, you can try washing the leaves with a mild soapy water and rise it well to get rid of most of the aphids. The neem oil will kill them too, and has residual effects to keep them from coming back… but it can take a few days before you notice a difference on a heavily infested plant. Definitely don’t use any type of chemical pesticide on aphids, they can become resistant to chemicals very quickly. I have petunias, herbs, and roses planted in separate containers on my patio and I’m dealing with aphids on the roses and slugs and caterpillars on the petunias. I’ve also got some brown spots and basil bugs on my basil that has been flourishing until now. I’m going to put ground eggshells into the petunias with slugs but would the neem oil help with the caterpillars and aphids? And what can I do for my poor basil plant? Thank you! 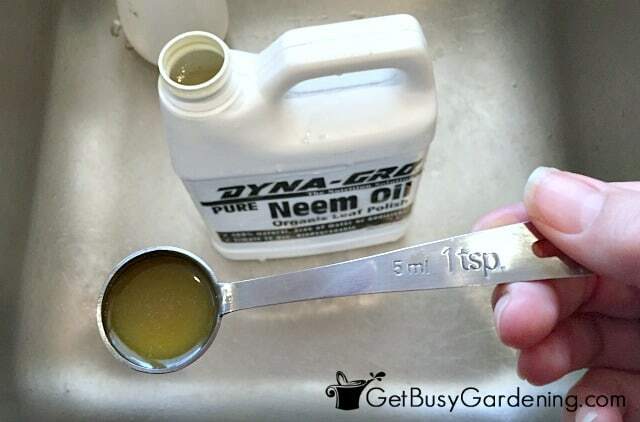 Neem oil will definitely help to get rid of the caterpillars and aphids, but be careful using it outdoors on flowering plants because it can also kill bees and other beneficial insects if it’s sprayed directly on them. It won’t harm beneficial insects once it’s dry, so it’s best to spray the plants in the early morning or evening when the bees aren’t active. I was wondering if Neem oil can be used on fleas inside the house? I know you can use it as a pain medicine for insect bites after an animal is bitten but what about as a deterrent. Sorry but I’m not sure. Neem oil can be a lung irritant so I would be careful spraying it all over your house as you would need to for flea eradication. I have sprayed my ficus tree 3 times with Neem oil spray. The concentrate says to only mix with water, not soap. My ficus still has those darn little black bugs that make the leaves curl up. Plant has lots of new growth and trying hard to survive. Plant is on balcony and spraying the Neem oil spray makes a huge mess. I’m on 7th floor and not allowed to rinse it off with water so have to mop each time. Back issues so difficult. I only have Dawn and Dove body wash. Would that be mild enough to use with the Neem oil? Yes, my guess is that your neem oil treatments aren’t very effective because oil and water don’t mix… so you’re probably mostly spraying water on your plants, and the neem oil is staying in the bottle. Adding soap will help them mix, and make your treatments much more effective. However, I can’t recommend using body wash for the soap because I have never tried it myself, and I don’t know if the type you have will harm your plants. Body washes usually have lots of additives, like perfumes, lotions and oils that could end up causing more problems with your plant. I also don’t recommend using Dawn because it contains chemicals (like detergents and degreasers) that can be harmful to plants as well. Try to find an organic or more natural soap that doesn’t have all those additives, Dr. Bronners Baby Mild liquid soap is my go-to. Yes, neem oil works great as a natural pesticide. But be careful with your soil drenches, because if the soil in your plants is staying wet all the time, it’s not only bad for your plant, it’s a breading ground for fungus gnats (especially if the other pesticide you’re using doesn’t have a residual effect). 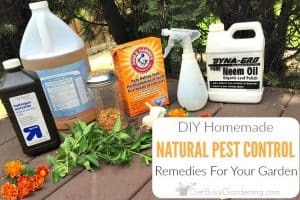 Neem oil does have a residual effect, so it can work to kill those pesky bugs for good, but I would definitely allow the soil on your plants to dry out before drenching it again. GnatNix is also a wonderful product to get rid of fungus gnats without having to continuously drench your plants soil. Also, you said you’re trying a “fungicide” spray too, but I think maybe that’s a misprint and you meant to say pesticide?… fungicide is for killing fungus and mildew, and won’t work to kill bugs. Hello! Happy to report that neem oil is wonderful! I have used it along with the remaining BTi to kill all stages of fungus gnats and WOW, what a difference! I can honestly and happily report to you that I have turned the corner on the infestation and it GONE! In fact, I really attribute the neem oil in helping the most if not all the infestation (not sure the other worked, maybe only on larvae stage, hence why it took so long to get them under control). The spray I mentioned has .09% neem oil w/in it and it worked. It has other components too for the fungicide etc. Next time though, will invest in straight neem oil w/baby soap so it mixes well. Thank you so much for your helpful advice! I am going to purchase your book too, will be great to have on hand for future problems. My plants are looking great and I cannot believe I actually won the war against fungus gnats! Thank you, thank you, thank you! Woohoo, so happy to hear that the neem oil worked to get rid of your fungus gnat problem, thanks for following up!! Congrats! Glad to see neem oil in use as far as USA ! , We use it in our garden as a insecticide and fungicide ,It is very effective on Hibiscus (White powdery infestation). We also use neem cakes(a by-product of Oil pressing) as fertilizer/insecticide to prevent root infestation. The only downside is the odour . Brings back memories of childhood days when I had to swallow fresh ground tender neem leaf ( used to deworm). The reason I recommend using Dr Bronner’s baby mild liquid soap over the others is because the scented ones have essential oils in them. Some plants can be very sensitive to oils, and certain types of oils may end up damaging the plant leaves. You might be able to use them with no problems, but I have never tested them, so I can’t recommend them. 🙂 I’ve never heard of using fish oil for scale. Neem oil works great on scale, so you can just stick to using that since you already have it. I’m not sure about the age of your neem oil, it might depend on the type you have I suppose. I’ve had mine for a few years and don’t refrigerate it, and it still works just fine. Mine is a concentrate though, so if yours has other additives, then it may be different. Check for an expiration date on the label. Hi Amy, thanks for your great post! I’ve read online that homemade neem oil solution should be used immediately (within 8 hours). Have you found that applying neem oil solution that’s been sitting in the spray bottle for a few days or weeks is still effective? Or do you think a fresh batch of solution should be made for the testing phase and another batch a week later if the test leaf is undamaged? Thank you for the guidance! I leave my homemade neem oil solution in the spray bottle, and haven’t had any issues. Is it possible to use neem oil to PREVENT bug infestations? I found a mealy bug on my zebra plant and now am so paranoid that pests will infest my other house plants even though there isn’t any signs. I have searched the internet and there is nothing about preventing pests, only about controlling them once the plant is infected! Yes! Neem oil has a residual effect that will prevent bugs from infesting your plants. So you can spray it on plants to prevent an infestation. Hello, i made a homemade solution of neem-oil fungicide (1tsp neem-seed oil, 1 tsp sunlight soap, 1 litre of water) to kill some spider mites infested in a few orchid plants (which are still blooming) and the blooms are now shriveling up and falling off of the plant. Have i killed my orchids? i sprayed the roots and the leaves outside and I’m concerned this was not the right thing to do… if so, how can i clean the roots properly to ensure survival. Also i used neem-seed oil i purchased from a homeopathic shop. Does this make a difference? Any advice on how to save my babies would be greatly appreciated! Sorry to hear that your orchid is suffering from spider mites. I always recommend testing any type of insecticide spray on a leaf before spraying the whole plant because some types of soaps can be harmful to plants. I’m not familiar with the type of neem oil you purchased, but I would check the label to make sure it’s pure neem oil and doesn’t have any other additives. If the stuff you bought was made for cosmetic use, it could have some other types of oils or things added to it that may have harmed your plant. I would leave the plant alone and treat it as you normally would until it recovers. You could try rinsing the leaves and flushing the roots, which may help to rinse off the soap. If the spider mites come back while the plant is still recovering, you can mist it with water and gently wipe the spider mites off the plant until it’s healthy enough to try a different type of spray. Good luck, hope it recovers! Can I use this on the fungus gnat infestation I have in my herb garden? I’m growing sweet, cinnamon, lemon, lime and thai basil as well as peppermint, spearmint, oregano, thyme and cilantro. I’ve got a horrible infestation and while I’ve done the hydrogen peroxide drench, I’m wondering since this has a residual effect, can it be used on the herbs or will that make them unfit for eating?!?!? You can try using neem oil as a soil drench. But neem oil does take time to work, and usually takes several treatments to get rid of the pest insects. Fungus gnats are a sign that you’re overwatering, so the first thing I would do is allow the soil to dry out more between waterings. 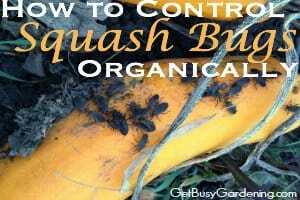 Here’s an article about how to get rid of fungus gnats. However, when you say they’re in your “herb garden”, do you mean a garden that’s outdoors? If so, I wouldn’t worry so much about the gnats, they won’t harm the plants. But, like I said, they are a sign that you’re overwatering, which will eventually be what kills your plants. I have a very persistent scale infestation on several of my succulents. I’ve tried chemical pesticides, neem oil and dr.brommer’s soap spray with and without rubbing alcohol in the mix, rubbing alcohol itself, capsicum garlic onion turmeric spray… i even tried asking them nicely to leave. Nothing has worked. I toss out infested leaves. I sanitize all of my equipment pots everything, I’ve sterilized the soil i use. What do i do now about these pests? Oh no, sorry to hear about your scale problem!! Scale is one of the most difficult pests to get rid of. They can hide in places that you wouldn’t expect, and re-infest the plant even after you’ve cleaned and debugged it. They can hide in places like under the rim of a pot or plant tray, on the bottom of it, or even in crevices in the area around the plant. So, you can spend all that time debugging the plant, only to put it back in the same spot or miss some on the pot or plant tray, and your plant ends up becoming infested again a few weeks later. It also takes a lot of persistence to get rid of houseplant scale for good. So, my recommendation is to continue treating the plant for several months, even after you see no signs of scale. Also, isolate the plant, clean the pot, plant tray and the area around the plant well with rubbing alcohol or soapy water. You might even try moving the plant to a different area. Remember that the eggs are nymphs are tiny and very difficult to see.